Once the French granted independence to the kingdom of Laos, the country formed a government and created the Royal Lao Army (RLA) for defense purposes. Gen. Sounthone Pathammavong was the first Commander-in-chief of RLA, with Col. Phoumi Nosavan as his deputy as well as chief of the military staff. Gen. Ouane Rattikoune was the next Commander-in-chief, with Gen. Amkha Soukhavong as his deputy. This was the time Capt. Kong Le mounted his coup d’état on August 9, 1960. Gen. Amkha Soukhavong was dispatched by Prince Souvanna Phouma to collect rice food supplies in Xieng Khouang to feed the troops in Vientiane, but was detained by Maj. Vang Pao in the Plain of Jars and was delivered to Gen. Phoumi Nosavan in Savannakhet. After Gen. Phoumi Nosavan liberated Vientiane on December 16, 1960, Gen. Bounleuth Sanichanh became the third Commander-in-chief of RLA, with Gen. Phoumi Nosavan as his deputy. The National Coordination Directorate (“Direction Nationale de Coordination, DNC”) was the created to serve as the central government agency. On April 19, 1964 following the coup d’etat mounted by Gen. Kouprasith Abhay and Gen. Siho Lamphouthakoun, Gen. Ouane Ratikoun came back to serve as RLA Commander-in-chief for the second time. In order to stay in the loop, Gen. Phoumi Nosavan still served as RLA deputy Commander-in-chief. In 1965, Gen. Kouprasith Abhay mounted a coup d’etat and forced Gen. Phoumi Nosavan, Gen. Siho Lamphouthakoun and Gen. Thao Ma to flee to Thailand. In 1966, Gen. Ouane Ratikoun retired from the RLA and was replaced by Gen. Bounpone Makthepharath as RLA Commander-in-chief, with Gen. Kouprasith Abhay as his deputy until 1975 –the year the Lao communists took power. Each MR had the task of supporting other MR’s on an as-needed basis. For example, MR-I, MR-III and MR-IV had to deploy troops to support MR-II many times in 1970, 1971 and 1972 MR-II had to deploy troops to support MR-I, MR-III and MR-IV in 1970 also, although its main priority rested with its own MR, which was in the front line of the capital city of Vientiane. The loss of MR-II to the enemy could only mean the unavoidable loss of the entire kingdom of Laos. This was the reason why North-Vietnam had always deployed massive troops to attack MR-II. 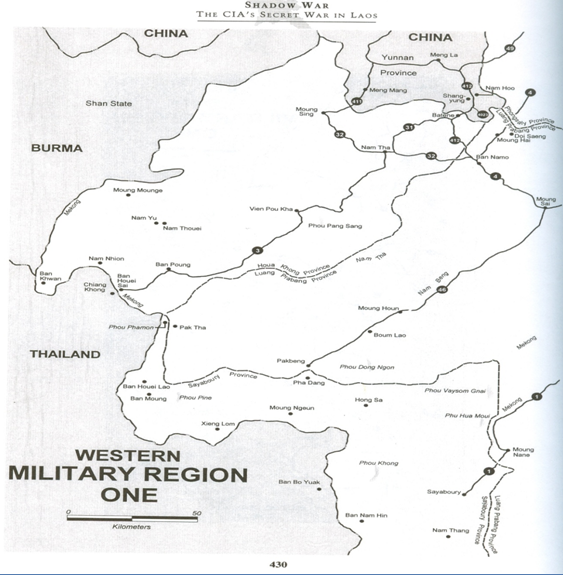 Laos was at the front end of the communists’ infiltration line into southeast-Asia. The US was particularly concerned about Laos’ security, because this was a small country that could not defend itself against communist invasion. Therefore, the Royal Lao Government had to cooperate with the US in the defense arena because communist North-Vietnam (1) violated the 1954 Geneva Accord signed by 13 countries that recognized Laos’ independence, (2) had been using Laos as a place for hiding, training and moving its troops to attack South-Vietnam, and (3) openly took part in post-Kong Le’s coup d’etat activities that preceded the war between the US and North-Vietnam. The US involvement had led to several developments in Indochina, including the change to a communist regime and the multi-million refugee exodus. In1963, MR-I consisted of the following provinces: Phongsaly, Louang Namtha, Sayabouri, Bokeo, Oudomsay and Louang Prabang. The civilian population in this MR-I was pro-leftist, more so than in any other MR’s because of the many heavy attacks that went on in the northern and eastern part of the region. MR-I lost Nam Bark Camp and the whole Phongsaly province since 1962 and its northeastern part close to Houaphan Province since 1965. Communist infiltration in this region started as early as during the French war and peaked during the US intervention in the Indochina war. GM-11: 111, 112, 113, 114, and 115; GM-12: 121, 122, 123, 124, and 125; GM-13: 131, 132, 133, 134, and 135; GM-14: 141, 142, 143, 144, and 145; GM-15: 151, 152, 153, 154, and 155. One battalion was comprised of five companies: Companies 1111, 1112, 1113, 1114 and 1115; Companies 1121, 1122, 1123, 1124, and 1125; Companies 1131, 1132, 1133, 1134, and 1135; Companies 1141, 1142, 1143, 1144, and 1145; and Companies 1151, 1152, 1153, 1154, and 1155. There is no information available on MR-I troop composition after February 1974. 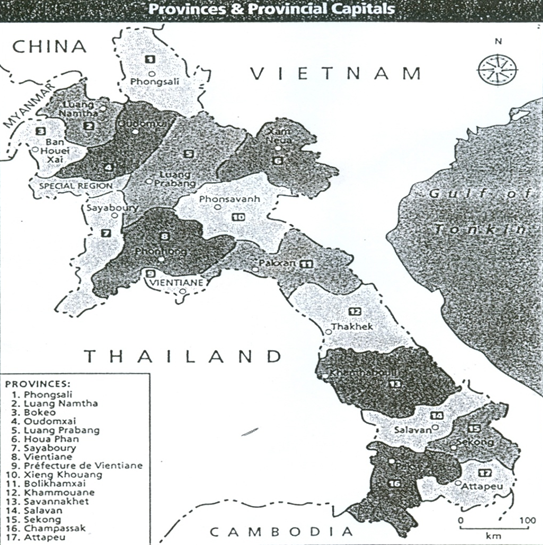 MR-II was created in 1962 and covered Xieng Khouang and Houaphan Provinces. This MR had the longest border line with North-Vietnam than any other MR’s and also sustained the heaviest enemy attacks, considering that the headquarters of the Lao Communist Party was located in Samneua. This important war zone created the highest threat to North-Vietnam because it was close to Hanoi, its capital city, and was in the front line of Laos’s royal and administrative capitals of Louang Prabang and Vientiane respectively. As mentioned earlier, loosing MR-II would be militarily and politically like losing the whole country. This explained the heavy attacks this MR-II had to sustain over the years. The headquarters of MR-II was located at Long Cheng. Its commander was Maj. Gen. Vang Pao, assisted by two deputy-commanders, Brig. Gen. Tiao Monivong (lowland Lao) and Col. Neng Chu Thao (Lao Hmong). In 1960, MR-II troops had less than 10 battalions strong, compared to the 40 battalions of Vietnamese and Lao communists used in the invasion of the Laos kingdom. In 1970, Gen. Vang Pao reorganized those 10 regiments into one division consisting of 8 regiments: GM21, 22, 23, 24, 25, 26, 27, and 28. Each regiment was made up of 4 battalions and one commanding battalion. Each battalion had 4 companies and one commanding company. One regiment comprised five batallions: GM(Groupement Mobile) 21: 211, 212, 213, 214, 215; GM 22: 221, 222, 223, 224, 225; GM 23: 231, 232, 233, 234, 235; GM 24: 241, 242, 243, 244, 245; GM 25: 251, 252, 253, 254, 255; GM 26: 261, 262, 263, 264, 265; GM 27: 271, 272, 273, 274, 275; and GM28: 281, 282, 283, 284, 285. One Division of the Royal Thai Army came to help MR-II in 1967. All those troops were funded under US assistance, which ended in 1973. 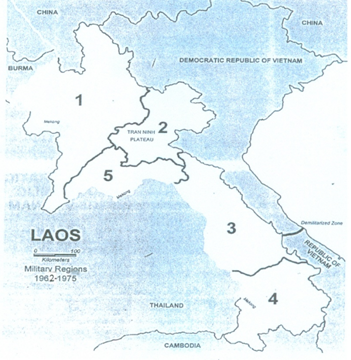 In February 1974, troops in the five military regions of Laos amounted to only 52,329, compared to 33,115 Lao communist and 40,000 North-Vietnamese troops –a total of 73,115. In 1974, MR-II had less than 10 regiments –GM 21 to GM 28 that were reshaped as battalion GI(Groupement Immobile) 201 to GI 212. 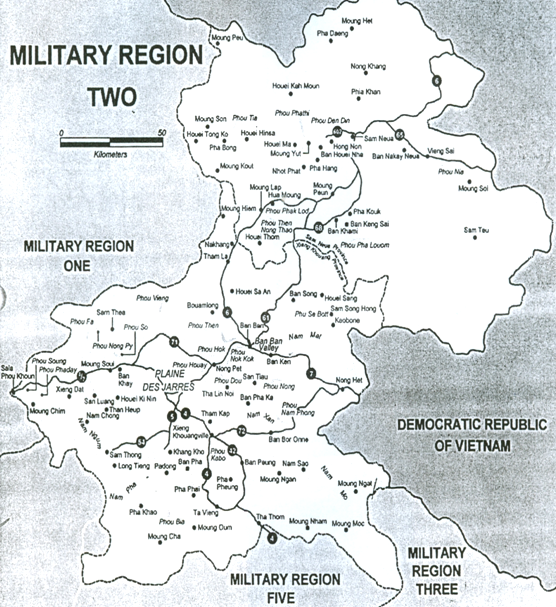 On May 22, 1974, the lack of US assistance compelled Gen Vang Pao to modify his plans, including (1) demobilizing some of his troops and send them to learn how to farm and breed animals, do business, or attend school, and (2) put the remaining 5,000 troopers on the Royal Lao Army’s payroll. All these changes reflected the weaknesses of the Vientiane’s faction and were taken advantage of by the Lao communists who attacked GI 212 at Bouam Long and GI 211 at Muang Mork. Because military losses to the enemy throughout the country in 1975 were very heavy, due to the US’s unexpected and sudden retreat from Indochina, the military officers and recruits from those two camps fled into the forest but were later surrounded by the Lao and Vietnamese communists and executed. 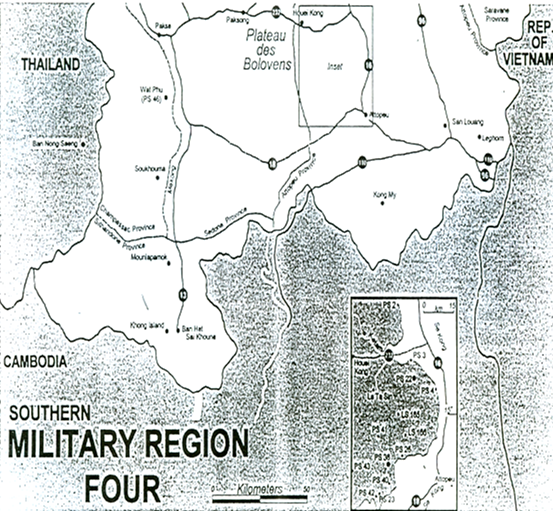 In 1962, Military Region III was comprised of the following provinces: Bolikhamsay, Khammouane, Savannakhet, and Saravane. 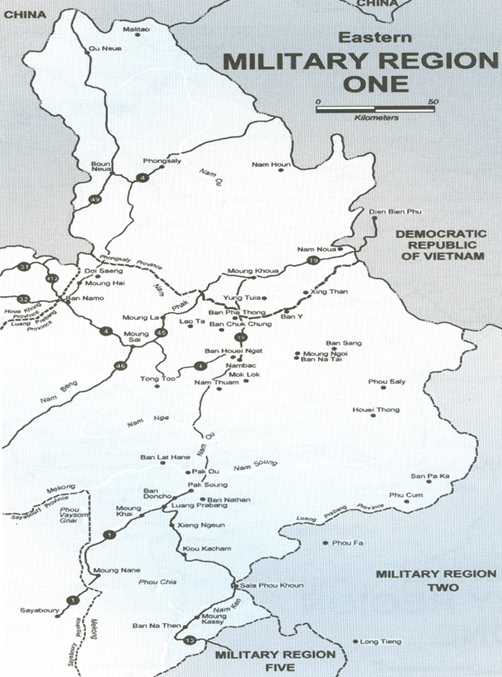 This was the region through which North-Vietnam built the Ho Chi Minh Doan trail toward South-Vietnam. For that reason, MR-III was the most heavily bombarded region of all five Lao MR’s by the US Air Forces. Conversely, North-Vietnam also used the most sophisticated weaponry they could find to protect the Ho Chi Ming trail –not the usual weaponry used in the Second World War. Their anti-aircraft artillery was ultra-modern and consisted of surface-to-air missiles (SAM) and weapons with firing ranges even greater than the US firing ranges. Although the US air operations were more to advantageous to the US, they were still very risky to the US Air Forces. Map #125. 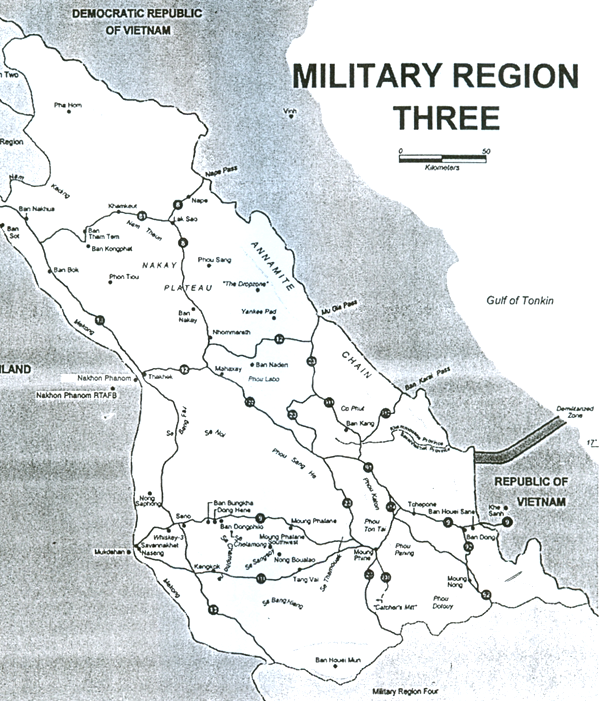 Military Region III. MR-III’s headquarters was located in Savannakhet. The MR-III’s commander was Gen. Nouphet Daoheuang –who was later lured into the re-education camp in Vieng Xay, Houaphan Province and died in the hands of the Lao communists and the North-Vietnamese in a very atrocious way. His deputy was Brig. Gen. Khong Vong-Norath. MR-III’s armed forces consisted of Division III, which included five regiments: GM 31, 32, 33, 34, and 35. Each of the GM had five battalions –4 fighter battalions and 1 commanding battalion. Each battalion had 4 fighter companies and 1 commanding company. No data on the changes that took place in 1974 are available. In 1972, MR-III deployed Regiments 33 and 35 to help MR-II attack the Plain of Jars. Their deployment was cut short by the cease-fire agreement, forcing the two regiments to return to their bases without any fighting. 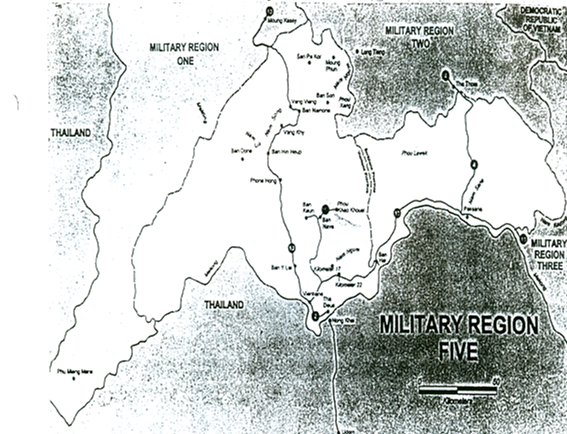 Several Thai regiments reinforced Military Region III in their fight against the Communists. MR-IV covered the provinces of Sekong, Champasak, Attapeu and Sedone with common border lines with Cambodia to the south, and with South-Vietnam to the east. Between 1959 and 1970, King Sihanouk did not get along too well with the US. As a result, Cambodia had to let part of its territory be used as a hiding place by North-Vietnam and as training facilities by the Viet-Cong –a group of South-Vietnamese fighting against their own country. This strange situation had forced the US to directly attack Cambodia on many occasions. Sihanouk declared he was neutral, but that neutrality was not in itself very helpful because it allowed North-Vietnam to make heavier attacks on South-Vietnam. 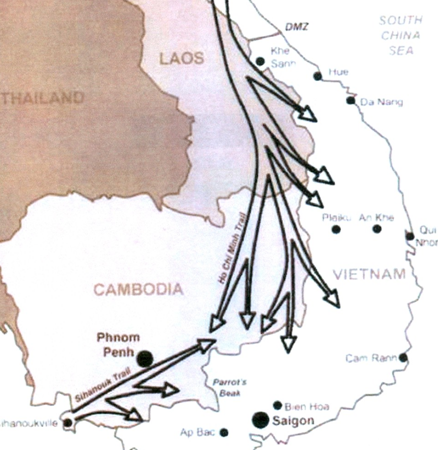 As the Cambodian border area with South-Vietnam was under heavy US air strickes, the Vietnamese communists expanded their occupation of MR-III and MR-IV and then further increased their fighting intensity. MR-III’s armed forces, Division IV, consisted of five regiments (GM): GM 41, 42, 43, 44, and 45. Each regiment was comprised of five battalions: 411, 412, 413, 414, and 415; 421, 422, 423, 424, and 425; 431, 432, 433, 434, and 435; 441, 442, 443, 444, and 445; 451, 452, 453, 454, and 455. One bataillon had five companies: Companies 4111, 4112, 4113, 4114, and 4115; Companies 4211, 4212, 4213, 4214, and 4215; Companies 4311, 4312, 4313, 4314, and 5315; Companies 4411, 4412, 4413, 4414, and 4415; and Companies 4511, 4512, 4513, 4514, and 4515. One division of Thai troops fought with Military Region IV since 1967. No information is available on the changes that took place after the reunification of two Lao political factions. In 1963, Military Region V consisted of Vientiane Province and the Vientiane Metropolitan area, the heart of the country which was always subject to constant, hard to predict political changes and the most difficult Lao region to defend. This was also the area, along with Louang Prabang, that the communists demanded to be treated as a regrouping center for the two Lao factions and devoid of any rightist troops. MR-V faced no military fighting. At that time, the enemy troop movements varied from one MR to the next, and thus required different types of military defensive operations. MR-V’s hedquarters was located at the Chinaimo Camp and under the command of Maj. Gen. Thonglith Chok-Bengboun, and his deputy, Brig. Gen. Atsaphanhthong Pathammavong. (Gen. Thonglith died at 5:30 a.m. on July 10, 2007 in France). MR-V’s armed forces, Division V, included 5 regiments: GM 51, 52, 53, 54 and 55. Each regiment consisted of five battalions, and each battalion had five companies. No information is available on the changes that took place after the political reunification of 1974. MR-I and MR-V covered the royal city of Luang Prabang and the capital city of Vientiane respectively –cities treated by the two Lao political parties (Royal Lao Government Party and Lao Communist Party) as neutral, reunification zones during 1962 – 1975. These two cities did not experience too many military activities, but a lot of political conflicts originated by the foreign embassies. They also produced more refugees than any other MR’s. Starting in 1975, the Laos PDR was subdivided into 17 provinces as follows: Phongsaly, Louang Namtha, Bokeo, Oudomsay, Louang Prabang, Houaphan, Sayabouri, Vientiane, Vientiane Metropolitan, Xieng Khouang, Borikhamsay, Khammouane, Savannakhet, Saravane, Sekong, Champasak, and Attopeu.